Van Cortlandt Park-bound 1 trains skip 103, 110, 116, 125 and 137 streets. No 3 trains between Utica Avenue and New Lots Avenue – free shuttle buses provide alternate service. Manhattan-bound 4 trains skip 176 Street, Mt. Eden Avenue, 170 Street, 167 Street and 161 Street. No 4 train service between Utica Avenue and New Lots Avenue – free shuttle buses provide alternate service. 4 service runs every 16 minutes between 125 Street and Woodlawn. 5 service runs as the 6 express between Wakefield-241 Street and Flatbush Av-Brooklyn College. No 7 service between Queensboro Plaza and 34 St-Hudson Yards – free shuttle buses provide alternate service, running in two sections, one in Queens and one in Manhattan. Flushing-bound 7 trains skip 33, 40, 46, 52 and 69 streets. Expect delays near 61 St-Woodside. Until November 19, L trains are not running between Broadway Junction and 8 Avenue on weekends – free shuttle buses provide alternate service between Rockaway Pkwy and Broadway Junction. 42 Street Shuttle service runs overnight from Saturdays to Mondays through October 29, excluding October 15. Norwood-bound D trains skip 25 Street, Prospect Avenue, 4 Av-9 St, Union Street and DeKalb Avenue. Coney Island-bound D trains skip 170, 161, 155 and 182-183 streets. Jamaica-bound F trains are rerouted via the E between 47-50 Streets and Roosevelt Avenue. No Q train service in Manhattan. 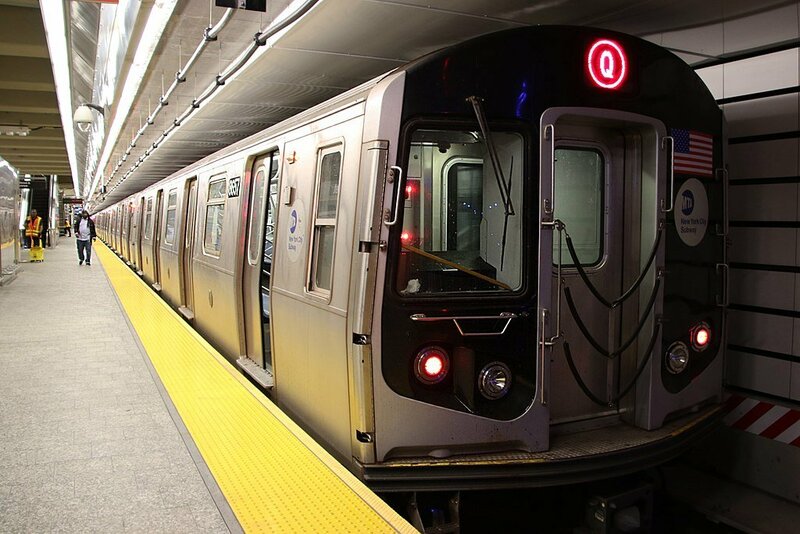 Q trains run every 30 minutes between Atlantic Av-Barclys Center and Stillwell Avenue. No Q service between Prospect Park and 96 Street – free shuttle buses provide alternate service. No R service between 36 Street and 95 Street – free shuttle buses provide alternate service. No late night R service. W train service extended and running between Whitehall Street and Ditmars Blvd. Astoria-bound W trains skip 36 Avenue and 30 Avenue.